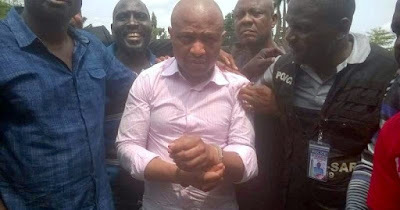 Billionaire kidnap kingpin, Mr. Chukwudumeme Onwuamadike, popularly known as Evans, will be arraigned before Justice Taiwo in Lagos High Court, Igbosere, tomorrow, Vanguard reports. He will be arraigned for the kidnapping of Mr. Sylvanius Ahanonu in Lagos and for the attempted kidnap of Chief Vincent Obianodo, owner of Young Shall Grow Motors, in Festac Town, in which Chief Obianodo’s driver and Police were killed. More arraignments are expected to follow on many other kidnappings in Lagos and Edo high courts. » Owner Of “The Young Shall Grow Motors” Loses Wife?